What the hell are these “regular expressions”, anyways?! Since version 3.4.1, the Dolphin Viewer 3 has the new, improved Area Search from FireStorm, where one of the major improvements is the ability to search using ‘regular expressions’. But what is a regular expression? I’ve put together a little help page here. Here’s the next Dolphin Viewer 3 for you: 3.4.4.26692. A fix for BUG-822 (Graphics Preferences slider now has 6 steps instead of the old 4, and the higher settings get applied properly now as long as they don’t crash the computer). MAINT-1672: Correcting the issue where changing position and hovertext on a child prim was broken and the child prim would not move. FIRE-4855/FIRE-8268: Fix for objects muted by name not being muted when worn as an attachment by Ansariel Hiller from Firestorm. Update to the latest viewer-development source, bringing more performance improvements to large groups and some crash fixes. “MU-Pose” emoting with a non-alphanumeric character, like a german umlaut, right after the colon now works properly in IM, thanks to Ansariel Hiller from Firestorm. The downloads are on the download page. Here’s the next Dolphin Viewer 3: 3.4.3.26620 with Group Services update. The random crashes when refreshing textures have been fixed. The inventory now has correct focus on the filter text input box on opening. The bug that makes prims not always move properly when the script changes position and hovertext at the same time is still around. Linden Lab™ have introduced a change to the graphics preferences that makes it impossible to go above your recommended graphics settings by using only the “Quality” slider. This means, if your graphics card is rated for “High”, setting the slider to “Ultra” won’t change a thing. It is still possible to change the single settings in the advanced view though. I’m currently investigating a solution to this. Improved group handling for large groups (> 10,000 members). Basically, it is now possible to actually see the member list of groups with over ten thousand members, as well as edit group settings and descriptions for groups this large. On the other hand, the release of the server side code for this means that you cannot edit group descriptions of groups with more than 10,000 members with older viewers anymore. Objects made from prims created by more than one person now show “multiple” instead of “unknown” when looking at the object profile in your inventory. When you try to enter a region that has a higher rating than your preferences, you get a popup offering you to change your preferences and continue on your way, or not enter. When you try to teleport someone to a region with a higher setting than that person has in their preferences you get a notification if applicable. Downloads are at the usual spot… the download page. This notice only affects linux users. On November 5th, openSUSE 11.4 has reached its end-of-life date. For linux-based users of the Dolphin Viewer 3, this means that there will be no more rpm packages for openSUSE 11.4 from now on. If you are using 11.4 and can’t upgrade to 12.1 or 12.2 you will have to use the tarballed linux release. For obvious reasons this has no effect on users of other linux versions, or Mac OS X or Windows. Using texture refresh on objects with sculpted prims can cause the viewer to crash. This is fixed in the current beta, and that fix will be in the next release. Child prims that are moved by scripts sometimes fail to move properly if they also have a hovertext that changes at the same time (e.g. the boom on MLCC boats). There is a fix for it that I’m trying to hunt down right now. For a workaround you can configure the MLCC boats to use a different childprim for hovertext. For this consult the notecards that come with the boats. (almost) Full support for handling pathfinding settings (note: the navmesh preview does not work yet as I am still waiting for my Havoc sublicense from Linden Lab). Marine Kelley’s RLV has been upgraded to the latest version, 2.08.03.04. Area search has been reworked and improved by Techwolf Lupindo from Phoenix-Firestorm. No more support for logging into opensim-based grids (The reasoning behind this has been explained here). The 3.3.24 installers will stay available on the download page. The download links are on the download page. It has been a while since I had the opportunity to announce a new feature that had the potential to change how people use the viewer. The Sailor’s Mini-map, Mark Two. 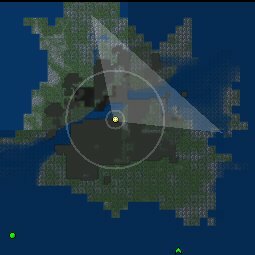 The Mini-map now shows parcel boundaries (white lines). 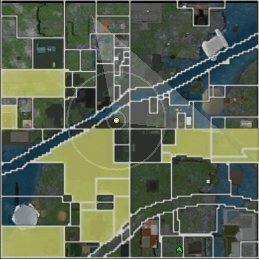 The mini-map now shows parcels that are for sale in yellow, same as the world map. All this can of course be disabled in the context menu of the mini map, and in Preferences->Dolphin Viewer 3->Navigation. As an added bonus the Mini-map does not have a space consuming title bar anymore. Reset graphics preferences to default button in status panel, next to draw distance slider, labeled “GReset”. Z offset reset button relabeled to “Z” to get room for GReset button. “Refresh texture” also refreshes sculptmaps of sculpted prims (corrected version of my own attempt, from Firestorm). “Restore inworld” now also sets the proper land group if you have “Rez with land group” switched on and are a member of that group. One thing to take note of is that this is the last version that has support for logging into other grids than Second Life Main and Second Life beta. The reasons for this have already been explained here. The downloads are on the download page, as usual.